sonnenFlat: sonnen’s ‘free’ / flat-rate electricity plan looks great. Is it worth it? German battery system maker sonnen has launched its ground-breaking sonnenFlat package – a retail electricity offer available to anyone with at least a 5kW solar system and a sonnen battery system with a minimum of 8kWh of capacity. sonnenFlat customers pay only a single monthly fee (starting at $30) to sonnen instead of having a conventional electricity bill – a proposal that is sure to be attractive to Australian electricity consumers facing yet another round of price hikes from this month. In this article we take a look at the sonnenFlat offer in an effort to determine how it stacks up against a) doing nothing and b) going solar, or c) going with another solar & battery system without a custom-made electricity plan. The company is the first hardware & software provider to move into the retail electricity space in Australia, putting it in a unique position to bring otherwise untapped value to those who purchase its home battery systems. With ample experience under its belt from years of successes in the European and US markets, sonnen is confident that it can deliver its stated aim of ‘clean and affordable energy for all’ to Australians as well – while upsetting the status quo and solving the energy crisis in the process. With sonnenFlat, the company combines all of the benefits and opportunities associated with distributed battery storage (e.g. solar self-consumption, energy self-sufficiency, demand response, peer to peer trading, virtual power plant functionality, frequency regulation, etc) and uses smart software to bring solutions to both households and the various segments of the electricity sector alike. sonnen already supplies 75,000 people in Germany with electricity through the sonnenFlat programme, which has been in place there since early 2016. 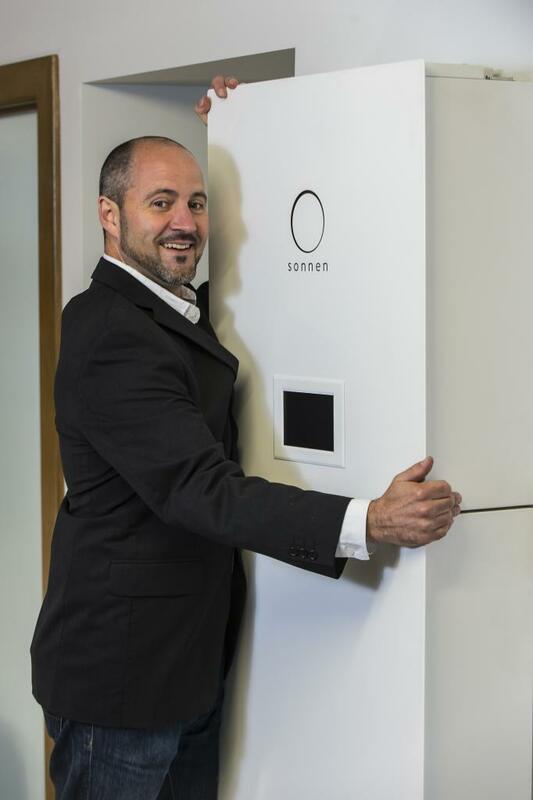 Philipp Schroeder, managing director of sonnen, at the sonnenFlat launch on 5 July 2017. Under sonnenFlat, all the electricity you consume is ‘free’ regardless of the source (solar, battery or grid), provided that you don’t use more than a prescribed amount of electricity per year (7,500kWh – or about 20kWh per day – being the ‘starter’ package). Any energy consumed in excess of this amount will be charged at a rate that is not yet clear to Solar Choice. While it’s not really ‘all you can eat’ electricity, the company says that they have endeavoured to ensure that systems are sized appropriately so that households on their sonnenFlat plans do not need to worry about being ‘stung’ with overage charges. There are three available sonnenFlat packages, each of which requires a different minimum solar & battery system size: 5kW solar / 8kWh battery, 7.5kW solar / 10kWh battery, or 10kW solar / 12kWh battery (as per the table below). Under a sonnenFlat plan, the customer essentially gives control of their solar & battery system’s daily operation to sonnen, who use it to either supply the customer with energy or sell stored energy (and other services that batteries can provide) into the electricity market. The customer is still the owner of the system and is responsible for all maintenance & upkeep to ensure that the system is running as expected – although sonnen’s monitoring will tip the customer off if anything is amiss. The customer does not need to worry about how much solar or battery capacity is available to them at any given point in time – as long as they keep within the prescribed annual ‘consumption allowance’ they will be charged only the flat monthly fee, which works out to between $360 and $600 per year (depending on the package). It’s sonnen’s responsibility to make the arrangement worth their own while; they anticipate they will be able to get to this point quickly as a ‘critical mass’ of sonnenFlat signups is achieved. The minimum contract term is 2 years, but system owners can opt to stay on for as long as they like (the standard sonnen system warranty is 10 years, although their high cycle life indicates that they could easily last much longer). sonnen anticipates that their customers will not wish to go back to conventional electricity billing with its inherent surprises once they’ve had a taste of a flat-rate plan. So is sonnenFlat worth it? So now the big question: Should you rush to purchase a sonnen battery system, sign up for sonnenFlat and let sonnen run your system – as opposed to purchasing a more ‘conventional’ grid-connected battery setup without the retail component? Or should you just get solar (or carry on with your existing solar system) without batteries at all? Or should you simply just ‘do nothing’ and take your chances with rising grid electricity prices? Keeping in mind that these figures are very rough (we haven’t done any comprehensive sensitivity analysis), it would seem that the sonnenFlat package in its totality is not yet a better deal than investing in solar alone when looking at cost projections over 10 years. That being said, if electricity prices increase at a rate greater than 3% annually, or if we look at a period beyond 10 years it is likely that the sonnenFlat scenario could work out ahead of the others. *Cost is higher because of battery-ready ‘hybrid’ inverter as opposed to standard PV inverter. The case for signing up for sonnenFlat will look even better if annual electricity inflation rates exceed the 3% used in our assumptions – something which is highly probable given the trends of the past few years (we have tried to be conservative here). It will also look even better as battery system prices inevitably come down. For example, a 50% reduction in prices for both the LG Chem and sonnen eco batteries would result in 10-year total electricity-related costs of about $19,210 and $18,300, respectively (roughly $2,000 and $3,000 less than the base case). 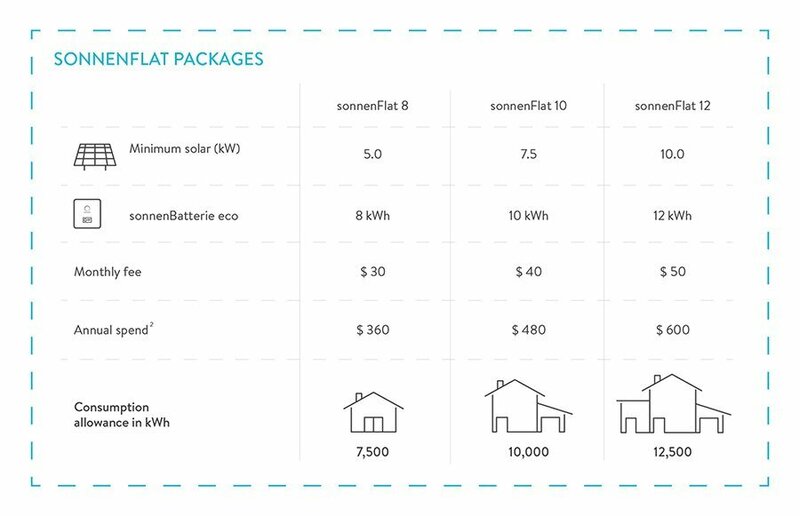 What this seems to indicate is that the sonnenFlat package puts sonnen in an unparalleled position to deliver greater and greater value as batteries become more and more affordable. The increase in savings with sonnenFlat will become disproportionately larger (as compared to non-sonnen battery scenarios) with each decrease in battery price. sonnen’s sonnenFlat package is unlike anything else on the market, offering battery equipment that is hand-crafted to work seamlessly with the company’s own retail electricity offer. The company’s outside-the-box thinking is exactly what Australia needs to overcome the energy conundrum it is currently is and choose comfortably at the current crossroads. But the energy provided under sonnenFlat is not actually ‘free’, as some media outlets have described it (usually in scare quotes, as I have here). Remember that you pay for your solar system and for the batteries yourself. On their own, without the sonnenFlat retail package to bundle them up and glue them together, you will still save a substantial amount of money on electricity bills with solar and non-sonnen batteries – and you won’t necessarily need to spend so much to get one. sonnen’s products are unapologetically on the ‘premium’ end of the market and it’s unlikely that they’ll end up competing with others on price even as their own prices drop in sync with broader trends. From an ordinary household’s point of view, the capital investment (around $14,000 for the 8kWh unit plus another few thousand for the solar system) certainly feels prohibitive – and the analysis above should show that a bit of apprehension isn’t unwarranted. That being said, the package will undoubtedly have appeal to those of us who are skeptical that electricity price inflation will hover as low as 3% per annum for the next 10 years, or who just want some kind of certainty about what we’ll end up paying. And with prices having just jumped by about 20% in three states, who wouldn’t be feeling a bit cynical about what other tricks the electricity market might have up its sleeve? With the launch of sonnenFlat, sonnen offers a solid alternative to a conventional retail electricity package and delivers a new layer of value to those who buy into its products and its vision. There is a gotcha with Sonnen’s Flat plans. I looked into it and got the figures how it all works. One thing that is not mentioned in the article is that your solar system must produce a minimum amount of kWh pa (unless I missed it in the article). If for some reason your annual production is not met, Sonnen will pro-rata your allowance, so you have to be careful how much you consume (doesn’t matter whether it’s grid/battery/solar). There are different levels for the 3 tiers they offer. In addition, you can only export so much to grid (after the batteries have charged and self-use) and Sonnen will pay about 8c at the moment but there is a limit how much can be exported annually. But you don’t actually lose your FiT. This information is badly missing from Sonnen’s website. I got the actual T&Cs from a reseller because I had some questionable questions to ask about Sonnen’s plans. So, in essence, you need to be absolutely certain you can meet all the criteria with fine detail. Sure it’s flexible (no need to worry about the source of your electricity – grid/battery/solar) but you do need certain criteria about production/consumption/export to avoid extra charges. Thanks for this comment – I’m sure many of our readers will find it useful. And yes, there is always fine print for deals like this. I gave up three quarters through article but it sound like a bad deal to me. We currently have a 3kw system with unused power going back into grid at 54cents a kw. We haven’t had a bill since it was installed. Why would I pay thousands of dollars for the unit then another $30 per month to them??? If you’re on a generous, legacy feed-in tariff, then batteries won’t make good financial sense for you no matter how you look at them. For the thousands and thousands of Aussie homes who don’t get a generous feed-in tariff, however, they’re starting to look pretty attractive. The best course of action for you is to keep your system as is until your feed-in tariff payments end. Three questions that have drammatic impact on the economic value of this solution. 1. Is the annual consumption allowance calculated as only what you draw from the grid (attractive) or does it include self consumption of your own (free) solar into your own consumption? So if my system where to produce 30 kWh per day – send 10 to the grid and self consume 20 kWh and say I had to consume another 15 kWh from the grid each day – would Sonnen count this as I consume consume 20 (self from solar) plus 10 from grid = 30 kWh per day, or just the grid part before the battery = 15 kWh per day, or say I had a 10 kWh sized Sonnen I would self consume now 30 Kwh per day and import only 5 – do Sonnen see this as using only 5 per day or 5 plus all self consumption = 35 kWh per day. This is glossed over but has a huge impact on system sizing and price of electricity! 2. Is all energy sent to the grid (not self consumed or used to charge the battery) gaining a grid feed in credit – or do you loss all this feed in benefit when you switch to a Sonnen Flat contract? 3. If you wish to upsize your system mid two year contract is this allowed and does it immediately move you to a different sized contract and rate plan under Sonnen Flat – or must you wait the remainder of the two year contract for the increased size to take effect? 1. The consumption cap (e.g. 20kWh/day) applies to all sources – whether you’re drawing from the grid, solar or batteries. In effect, sonnen take control of the solar & battery system and in exchange offer the customer a flat monthly fee and a consumption allowance. For engaged customers who would actively endeavour to make the most of their solar & battery system on a daily basis (perhaps yourself? ), sonnenFlat probably isn’t going to be an attractive option – it’s more of a ‘set and forget’ package. sonnen’s reasoning behind the flat rate (as I understand it) is that during certain times of year (especially winter), it will be harder for the household to make ends meet with their solar & storage system, while in summer there may actually be surplus energy. On balance throughout the year, you may end up using 20kWh, but it might look something like 35kWh/day in the winter and 15kWh/day in the summer (for example). There’s clearly a strong disincentive to get a solar system or battery bank larger than the bare minimums they require if you’re going to sign up for sonnenFlat, as anything larger essentially gives them more to ‘play with’ without any additional benefits to the owner. 2. You lose the feed-in benefits when you sign up for sonnenFlat because (as mentioned above), they effectively take control of the entire system. I’ve worked this into my modelling above (e.g. the LG Chem system has a feed-in tariff credit benefit, while the sonnen system with sonnenFlat package does not). In this modelling, the LG Chem retrofit option comes out ahead over 10 years – but a simple 5kW solar system looks even more attractive. 3) That’s definitely a ‘terms & conditions’ related question for the sonnen folks so I’d recommend getting in touch with them directly about it. I would like to keep up-to-date with the SolarChoice blog, but how do I do that in an automated way. My preferred methods would be to sign up to receive new blog posts by email or, alternatively, to monitor the blog via RSS/Atom feeds. But neither option seems to be available. Can you please advise? Thanks for your interest. You can sign up for our newsletter via this link.